With its drunken brawls and stupor-induced incidents, Showtime’s long-running “Shameless” (returning for Season 9 on Sept. 9) has much more stunt work required than many realize—and that’s where two-time Emmy–winning stunt coordinator Eddie Perez comes in. Perez, who started out as a celebrity bodyguard, opens up about the melding of creative physicality required of stunt work and what actors should account for when doing their own stunts. What does the role of stunt coordinator entail? When we get the script, whatever physical action is required by the actors, I sit down with the director and producers and talk about what work it could entail and whether we need a stunt double. What is your working relationship to actors as stunt coordinator? So many actors are like, “I do my own stunts.” It’s not that they can’t, and I never doubt anybody’s physical ability. But when you have to do it five or six times in a row and then you have another 10 hours of acting, let the stunt double do it. If you tweak the shoulder, the rest of the day you have to act and now you’re acting with a disability of sorts. It’s never a matter of you can’t do it, [but you have to think about] your main focus. Never think I’m attacking your ego or your ability. I’m just thinking about your longevity, your career. 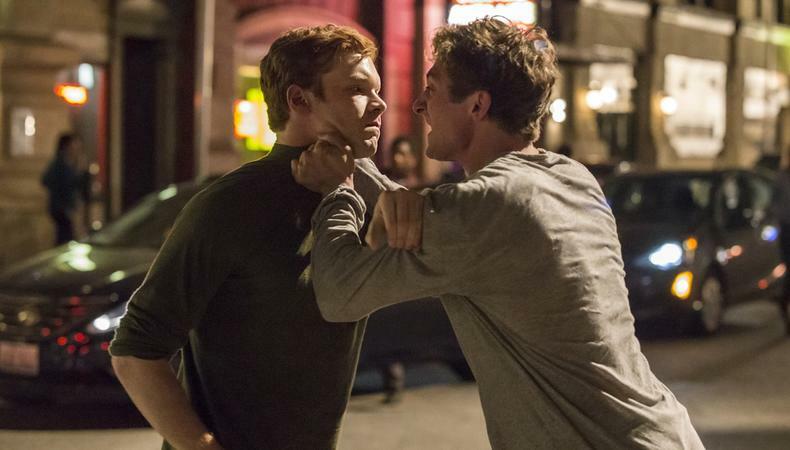 Is designing stunts for “Shameless” very different from, say, stunts for an action movie? For “Shameless,” we try to do a lot of actor action because it’s a comedy, and the physical aspect and the acting aspect of it is a really important part. A lot of people say to me, “I didn’t know there were that many stunts on the show.” And I go, “Good, then I’m doing my job.’” It’s situational, it helps propel the story, but it’s not the main focus. The action is not what people are tuning in for. People are tuning in to see what happens to this dysfunctional family. When designing stunts, are you thinking about the fact that the actor will need to “act” through them? Sometimes the physicality is dictated by the dialogue. Sometimes there’s four or five lines where it’s like, “OK, we have this line, where do these moments fit in?” So I will talk to the actors and say, “Here’s what I designed, where do you think this is gonna fit in?” And that’s where I rely on them, because it’s their character. Especially after nine seasons, it’s their character and I respect their character, so if they feel something doesn’t fit, I have to address that with them, and I want them to be happy with it. I have a template always, and we kinda walk through the template. We don’t have the time that feature films do, so there’s a lot of conversation, and sometimes I’ll shoot a video to show someone beforehand so they can have an idea of where we’re headed. It’s always a collaboration of sorts. How do you work with actors through tasks or situations that they may be uncomfortable with? Situations come up where people read it and they don’t think about it until they get there, and all of a sudden it’s like, “Oh, this is the reality.” It’s something as simple as hanging someone, and you put the noose around their neck and I’m asking them to trust me [while] not knowing me at all. A lot of actors just come in and it’s like, “Hi, nice to meet you. I’m gonna hang you today.” You have to trust me, so it’s a lot of conversation, I spend as much time as I can getting them to feel comfortable with me so they can have their experience and act. How did you initially get involved in stunt work? I started as a personal trainer. I trained Mickey Rourke, Anthony Michael Hall, and then I worked as a bodyguard for Pink Floyd, David Bowie, Duran Duran. When I worked with Sandra Bullock for a while as a bodyguard, I spent a lot of time with all the stunt people and started working with them more and more, and I was like, “This is home. I can be physical and creative.” In our industry you can blend the two, and you can find that happy medium. You have so many people who are former UFC fighters and professional athletes—people that are on top of their game and they’re now transitioning into stunt acting. Do you have any advice for someone who wants to pursue stunt work? With everything changing now online, if you have something that you’re good at specifically, put it out there online so people get their eyes on it. Having an iPhone, you can shoot your own stuff, so it also makes you a better performer because you start realizing what framing is, which is important because you are creating an illusion of sorts with a lot of the fight stuff; you’re never really in contact. It also teaches you camera awareness, so I think that’s a good place to start. Just put yourself out there. If you put yourself out there, you will get a response. Ready to work? Check out Backstage’s TV audition listings!